Plans for Australia and New Zealand cruising are on the up as P&O reunites the last three Sitmar ships and Princess bases both the Dawn Princess and Sun Princess down under full time. What attracts the world's attention is usually the meeting of Cunard Line's Queens in Sydney Harbour, especially this year, when the Queen Mary 2 met Queen Elizabeth 2 in the course of her last world cruise, but in fact there is a growing indigenous presence down under. Smaller players take part too, and while Celebrity plans to drop Australasia after a brief trial, there is no shortage of ships to replace that capacity. The foundation of cruising down under really comes from two companies, both of whom had been involved in the £10 a head assisted emigration schemes, which lasted up until the early 1970s. The most famous, P&O, had been the prime carrier between the UK, other realms and Australia/New Zealand since 1852 and operated its first cruises from Australia in 1932, while Sitmar, which started in the late 1940s, provided the Italian tradition. Famous P&O ships based in Australia have included the Canberra, Oriana and the first Sea Princess whilst Sitmar first offered cruises using the Fairstar, a former troopship with 4- and 6-berth cabins, and the Fair Princess, originally a Cunard liner. 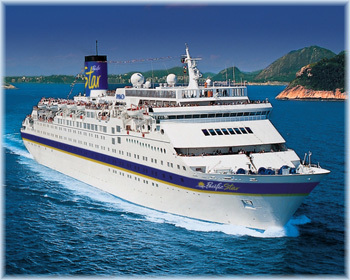 After P&O's Princess Cruises operation acquired Sitmar Cruises in 1988, other ships such as the Pacific Sky, formerly Sitmar's Fairsky, and Pacific Star and Pacific Sun, ex-Carnival ships, have been used down under. The Greek participant in the £10 assisted emigration scheme was Chandris, which at one time was the largest carrier of emigrants to Australia, and while successor Celebrity had a go at the Australian market, it did not seem to take. A fourth operator, CTC Cruises, pioneer of the air/sea route via Singapore (flying out from London and joining ship in Singapore), has not survived but has more or less been replaced by Creative Cruising. With last month's announcement of the shut-down of Ocean Village in late 2010, for the first time in many years, P&O Australia looks to be getting a good set of ships for its Australia fleet. While still "hand me down" these three have a common theme ­ they were the reason that Princess Cruises bought Sitmar Cruises in 1988. All three were under construction for Sitmar when Princess, not having any newbuilding program of its own, decided it needed to expand. The trio were introduced instead as Star Princess (launched as Fairmajesty and now Ocean Village), Crown Princess (now Ocean Village 2) and Regal Princess (already down under as Pacific Dawn)..
P&O Australia made its first big move a year ago, in 2007, when the 2,050-berth Regal Princess joined the fleet as the Pacific Dawn. Next to join at the end of 2009 will be the Ocean Village 2, to be renamed Pacific Jewel, reuniting a pair of sister ships whose exterior dolphin head design was noted in its day, having come from Renzo Piano. Having traded in the German market, latterly as Aida Blu, the Jewel has seen some modifications. She will probably be based at Brisbane. Recent comments on cruise boards indicate that many veteran cruisers actually prefer these 70,000-tonners (big in their time) to Princess's newer "Grand Princess" class of 100,000-tonners. At the end of 2010 the trio will be complete once more when the 1,624-berth Ocean Village heads down under as well. Having operated as Star Princess and P&O's Arcadia before becoming Ocean Village, this will be her fourth incarnation. Ironically, a fourth "new" Sitmar ship, the 1984-built Fairsky, the last cruise ship to be built with steam turbines, also operated for P&O Australia between 2000 and 2006 as Pacific Sky, before becoming Sky Wonder for Pullmantur (one of the very few sales from one large grouping, Carnival, to another, Royal Caribbean). The 1,022-berth Pacific Sun will be the fourth member of the P&O Australia fleet, and ships by then will be berthed both is Australia and New Zealand ports. In more recent years, Princess has itself decided to make a bigger impact in the Australian market and started by basing its Dawn Princess there year-round in November 2007. She is now to be joined by sister ship Sun Princess. In all, five Princess ships will cruise from Australia this season, bringing in many American travellers, some for the first time. Included in these will be the line's flagship, the 684-berth Pacific Princess (the commodore prefers smaller ships). In fact, Carnival Australia say 168,000 cruisers will travel in its ships from Australia in the next six months, with P&O, Princess and Cunard, a 20% increase on 2007-08. Other lines to be seen down under will include Celebrity, Holland America, Regent Seven Seas, Royal Caribbean and Silversea, the latter now basing its Asian marketing operations in Australia as well. Successor to CTC Cruises in the budget market is Creative Cruising, who have for several years been using ships owned by Classic International Cruises of Portugal. Beginning with the 430-berth Funchal, this year has seen Creative move up to the slightly larger 556-berth Athena. For fans of liner voyages, these ships usually offer a longer positioning voyage from Europe to Fremantle in November and a return from Fremantle, usually to a UK port, in March/April. Of course, Celebrity is also now down under, with its 2,038-berth Celebrity Millennium arriving at Sydney for the first time this Thursday, but her presence will be brief. 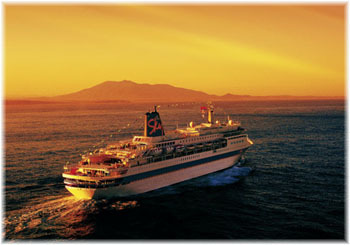 At the end of September the line announced that it would cancel its planned 2009-10 program in order to concentrate on the cruise market from San Juan. The return of Chandris to Australia will be very short-lived, but it seems P&O is more than willing to make up any shortfall (this does raise the question however of why one operator should have the lion's share of the market). Other lines based in Australia and New Zealand are on the minuscule side when it comes to number of berths. Sabrina Bratton's Orion Expedition Cruises offers 106 berths in its Orion, although it now has American owners and is said to be looking for second ship. 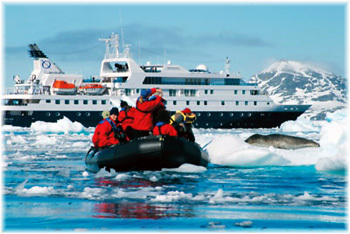 Aurora Expeditions has actually bought the 56-berth ship it was chartering, the Polar Pioneer, while Heritage Expeditions of New Zealand operates the 50-berth Spirit of Enderby. Offering more berths than any of these is Captain Cook Cruises of Sydney, who operate the 120-berth Reef Escape in Fiji and the 50-berth Coral Princess and Coral Princess II on the Great Barrier Reef as well as the 120-berth Murray Princess on the Murray River plus quite a fleet of small ships around the coast, in Sydney harbour and in Fiji. 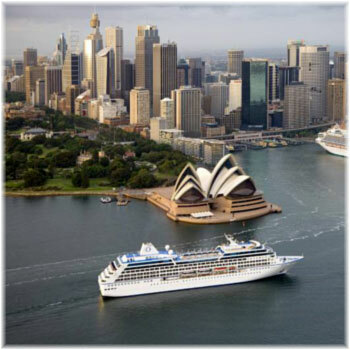 The Cruise Down Under organization, with its 57 members, has reported that total berth capacity in has risen from about 30,000 in 2007-08 to 38,000 in 2008-09, a growth of 27%, while passenger days in port have risen by 58%, from 407,000 to 643,000. The Australian market itself is quite limited and future growth will depend heavily on incoming trade from Europe, North America and Asia as well. Certainly, however, from the plans of cruise ship operators there still seems to be a lot of confidence in Australasia both as a market and as a destination. And Australians seem to be the only people in the world who don't think they will be seriously affected by today's financial crises. Time will of course tell.